With the appearance of the first Ebola case in Dallas, Texas, many people have suddenly awakened to the high risk we are all facing from this pandemic. Previous Ebola outbreaks have all been small, with the largest infecting only 425 people in Uganda, and only 224 of them dying from the disease. The current outbreak has infected 8,399 people, with 4,033 deaths as of the date of this writing. Computer models are projecting over 1.4 million people infected by Ebola by the end of January 2015 (source). This is getting scary. The Center for Disease Control and Prevention (CDC) has been downplaying the pandemic, making several press releases stating that it won’t get to the United States and even if it does, our medical community is ready to deal with it. All those assurances went out the window when that first case broke out in Dallas. It was clear that we were not ready to deal with this. Ebola is a virus; an organism about 0.02 microns in size. It is so primitive, that it’s unable to live and reproduce on its own. All it can do is live in a dormant state, until it comes into contact with a living cell. Once it does, it enters that cell, hijacking its nucleus and turning it into a reproduction factory, creating new Ebola virus strands. This ultimately kills the cell. As the virus continues reproducing in the body, it gradually consumes more and more of the body, causing a massive amount of internal bleeding. Ebola is known as a hemorrhagic fever for this, as it causes both a fever and hemorrhaging. It takes anywhere from two to 21 days for this incubation period to complete, in which the virus is replicate itself enough within its victim for symptoms to appear. Once they do, Ebola appears much like the flu, making it hard to diagnose. However, the sickness accelerates rapidly from that point, killing most patients within ten days. The CDC has been touting that Ebola spreads only by contact with bodily fluids and is not airborne. This is true, but it’s not all of the truth. Ebola is not airborne, as that would mean that it could float around in the air, waiting until it encountered a victim to infect. It can’t do that. However, the term “bodily fluids” doesn’t just mean a puddle of blood or urine. It can also mean saliva and mucus. So, when patients who have Ebola cough and sneeze, they are spreading Ebola through the droplets of saliva and mucus that are leaving their body. We’ve also heard from the CDC that an Ebola patient isn’t contagious until they show symptoms. That’s true in most cases, but coughing and sneezing are definitely symptoms. So, they are contagious from that first sneeze. Here’s the worst though, if they were already coughing or sneezing, before becoming infected with Ebola, they’re contagious much earlier. Ebola can also live for short times on surfaces which have been in contact with the bodily fluids of people who are infected. So, if someone has Ebola and sneezes, the droplets from their sneeze contaminate all the surfaces they come into contact with. That could be all the way across the room. The Ebola virus survives longer on hard surfaces, such as Formica and glass, than it does soft or porous surfaces, such as cloth. So a tabletop which became contaminated might be contaminated for a few hours after becoming infected. Anyone who touches that tabletop could become infected, especially if they ate a hamburger with the hand that touched the table. How Can You Kill Ebola? As a virus, Ebola is actually rather fragile. Ultraviolet light is uniformly deadly to viruses, destroying part of the protein covering for the virus and preventing it from working. So it can be killed by being exposed to direct sunlight (which contains ultraviolet) or a black light (which also contains ultraviolet). Viruses, like Ebola, can also be destroyed by contact with disinfectants. A mixture of 1/2 cup common bleach in a gallon of water makes a great disinfectant. This can be used to decontaminate objects which have come into contact with the bodily fluids of Ebola patients, as well as decontaminate the protective clothing of those who have been in an Ebola environment. Unfortunately, there is no known medicine which can kill Ebola in the human body. Some experimental drugs are being fast-tracked into testing, but there is nothing conclusive on this yet. There is no vaccine either which will stimulate the human immune system to produce antibodies for Ebola. How Can You Protect Your Family From Ebola? With the ease that Ebola spreads from person to person and the lack of available treatment, the only real way of stopping an Ebola epidemic is isolation and quarantine. That either means finding everyone who has been in contact with a victim and putting them in quarantine for 21 days, until the incubation period is over or quarantining areas where the virus is active, condemning everyone in that area to death. You and I can’t do anything about quarantining other people, but we can quarantine ourselves and our families from them. In other words, if there is an Ebola outbreak in your area, you either need to bug out to a remote location, before any of your family can become infected or bug in, sealing yourself off from anyone else. Bugging in is actually a fairly good option, if you have the means to keep yourselves alive while you are waiting for the epidemic to burn out. Water and electrical service will probably remain on, unless the disease becomes so bad that there is a general breakdown of society. But you’ll need to have everything else you need to survive already stockpiled in your home. You’ll also need to be able to filter your water to get out any viruses that may appear in it. That means using a 0.02 micron filter. The only companies that I know of which produce water filters which will work for that are Sawyer and Berkley. By staying inside your home, while the disease is wrecking havoc outside, you should be perfectly safe. If you have to go outdoors, anywhere where you might have contact with people, you’ll need to dress yourself in a bio-hazard suit. That’s the type of suit you see the healthcare workers wearing in pictures of the Ebola outbreak in Africa. While actual bio-hazard suits are expensive, you can make some substitutions to have your own bio-hazard suits which are just as effective, for a much lower price. Tyvek coveralls, like those that are used in factories and for hazardous waste cleanup work extremely well as a bio-hazard suit. You’ll also need rubber gloves, rubber boots (or Tyvek boot covers), goggles and medical masks. When you put the suit on, you’ll need to tape the wrists to the gloves and the cuffs to the boots, to close off any air passages. This can be done with clear packing tape or masking tape. Duct tape will work as well, but it won’t come off as easily. To ensure that no viruses can make it through the medical masks, spray them with the same bleach disinfectant that I mentioned earlier. Be sure to put the hood up on the suit and cover your face with the goggles, mask and hood. Before taking off the suit, you need to be sprayed down thoroughly with the disinfectant solution. This will kill any Ebola virus particles that have gotten on the outside of the suit. Once you take it off, your body and clothes should be sprayed with disinfectant as well, as an added safety precaution. Then you can shower off the bleach. With these precautions in place, you will be well protected from any chance of contracting Ebola. It would require someone trying to infect you maliciously for you to become infected. 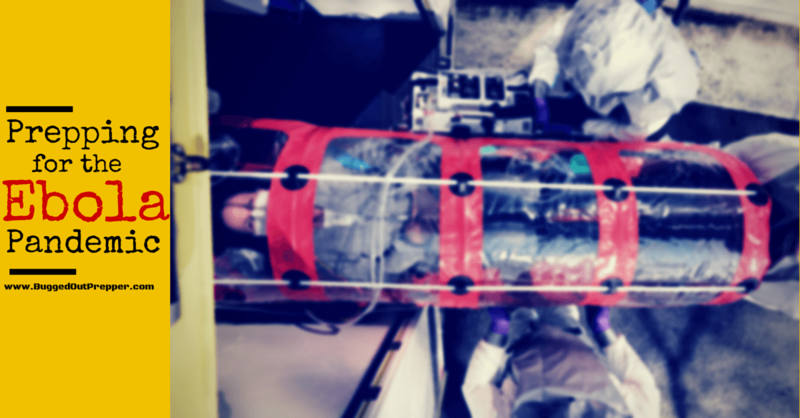 What one thing are you going to do to be better prepared for the Ebola pandemic?